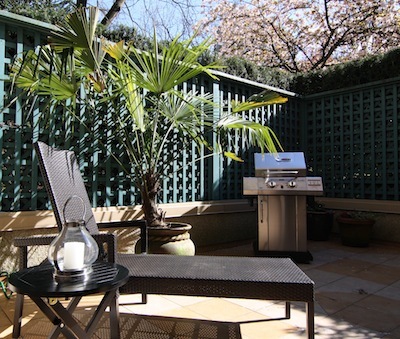 An urban oasis awaits you nestled in the heart of the West End and within walking distance to the best of Vancouver! The natural beauty of Vancouver is at your fingertips with the Seawall, English Bay and Stanley Park just steps away. Equally close are the fabulous amenities Davie, Denman and Robson Streets have to offer. From a bevy of independent and popular coffee shops and restaurants to book stores, art galleries and world class shopping, everything your heart desires is only minutes away. Take the water taxi or hop over the Burrard Street Bridge to the Granville Island markets and restaurants or to the quirky Kitsilano shops and beaches. Wander downtown and explore the waterfront with new convention centre and cruise ship terminal and historic Gastown or the hustle bustle of the Yaletown and Chinatown districts. It's all within walking distance! The condo itself is a stunning 2 bedroom 2 bathroom unit with an incredible private fenced 300 square foot patio on beautiful, quiet, tree-lined Comox Steet. The bright and sunny unit features premium materials and furnishings throughout with gleaming reclaimed oak hardwood floors. The spacious kitchen offers plenty of storage and granite counter space for your culinary adventures. 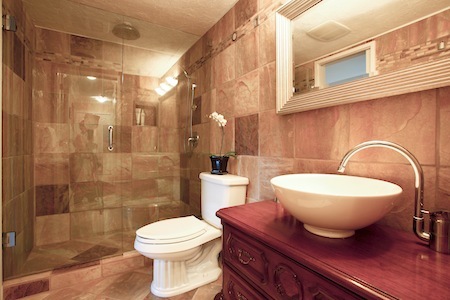 The bathrooms feature Italian tiles with dual rain head showers and contemporary bowl-style sinks. 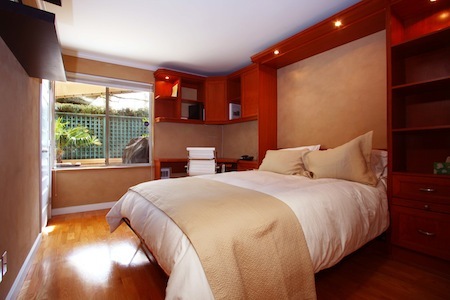 There are two bedrooms, one with a king bed, the other with a queen bed and both have very large closets. The master bedroom with the king bed has a bathroom with a Jacuzzi tub and shower. 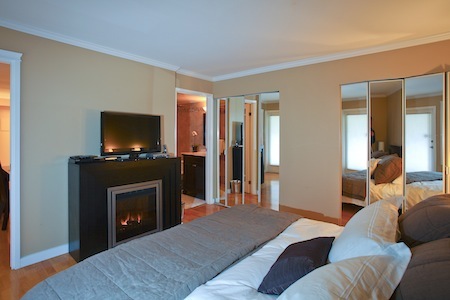 There is also a Samsung 32 inch LCD TV with Blu-Ray player and an electric fireplace. 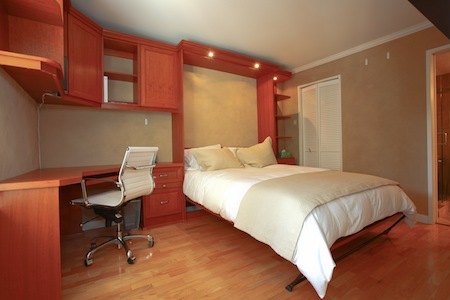 The second bedroom with the queen bed has a gorgeous built-in hardwood desk/wall/Murphy bed unit. The deluxe queen bed can be left out or easily tucked-away within the built-in wall unit to provide more work/office space if desired. The choice is yours. 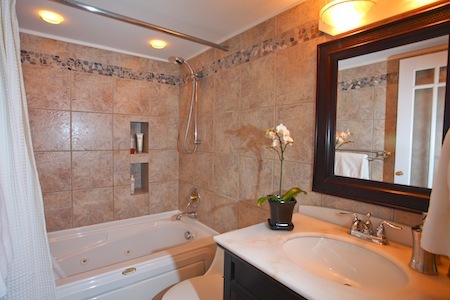 The other bathroom is adjacent to the second bedroom and the living room, and it has a gorgeous deluxe stall shower. Both beds and bathrooms are outfitted with luxury linens from Ralph Lauren and the Hotel Collection. All blankets and duvets all hypo-allergenic as are the large selection of pillows. The towels are all from Restoration Hardware's luxury linen line. 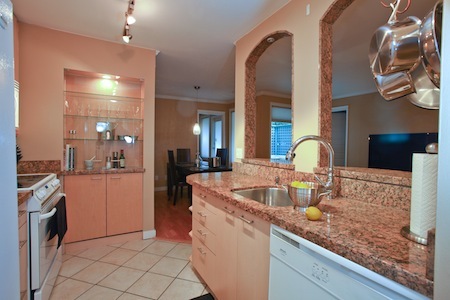 The contemporary kitchen has a fridge, convection oven, microwave and dishwasher. The living room has a couch with built-in chaise and an ottoman, with additional seating at the dining table. There is a 50 inch Samsung Plasma TV, complete with Blu-Ray player and a Bose Wave Audio system. 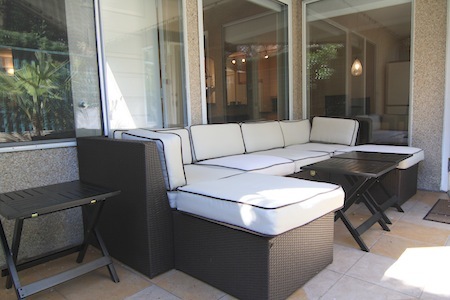 Enjoy the beautiful of the outdoors on the fantastic private patio equipped with a gas barbeque and a chic contemporary outdoor seating area with couch and ottoman - perfect for reading, relaxing and dining at the beginning or end of your day in the wonderful west coast fresh air. The unit comes compete with telephone, answering machine and a high speed WiFi internet access, as well as digital cable and convenient in-suite laundry with a front loading Bosch washer and dryer. For your safety and convenience, the condo also has a monitored alarm system and comes with one dedicated secured underground parking spot. The apartment was just perfect for what we needed. We were just a couple of blocks away from our son's apartment, so going back and forth was easy. We were also able to spend a week in Vancouver without needing to hire a car since we were easy walking distance to nearly everything we needed. Stanley Park is close by, so we were able to go running through the park and on the seawall every day despite terrible weather!. The apartment is comfortable and the owners have been very thoughtful about the kinds of equipment one might need during a stay. The wireless internet works well, and the printer/scanner came in handy when we suddenly needed to sign and send some important papers. The kitchen is well supplied after a big shop at a nearby supermarket, we were able to prepare meals at the apartment when desired. We would definitely stay at this apartment again. 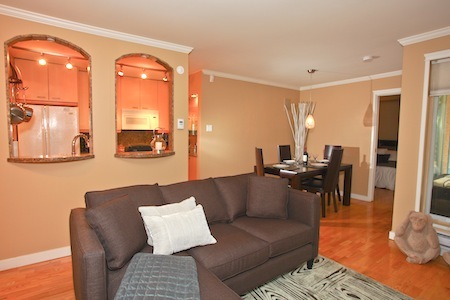 Huge thank you to Brenda Dominy for all her assistance in booking the perfect apartment for my family in Vancouver. She understood clearly our needs and recommended the best place for us. Also a huge thank you to Isabel Portele who was our greeter in Vancouver. She was very informative and made sure our arrival and departure was a pleasant experience. I would highly recommend EMR Vacations for anyone looking to find the perfect accommodation away from home! Thanks everyone at EMR! First time we've visited Canada and 1st time we've used EMR Vacation Rentals. The apartment and full service we received was excellent, we will definitely use them again. Your service, from the original correspondence to the efficient greeter and the stunning accommodation, was excellent. We will definitely use your service again whenever we visit Vancouver. Great service and accommodation look forward to booking with EMR again and certainly will recommend this accommodation to business, friends, and family. The unit we rented exceeded our expectations. It was well-equipped, clean, and comfortable. We enjoyed being able to make meals and the kitchen was very well equipped. The location was perfect. We had excellent service from our greeter. We will definitely use EMR again! The condo was great! The location was perfect. We really enjoyed it. We would definitely like to stay there again next time we are in Vancouver. Thank you so much. The only thing that would make it perfect would be 2 twin beds instead of the queen or king. But other wise it was fantastic! Blake with EMR provided excellent service and helped us choose this location. The greeter was great and had everything ready for us before arrival. The best part was the apartment. Excellent decor, attention to detail, great location and I can go on for ever. My 10 year old loved the place and so did we. Will use EMR every time we are in Vancouver. We really liked the apartment.It was in excellent condition. Linens were so clean and tidy.My kid was happy to see Wii games. We want to thank the owner for thinking about the guests small needs. I strongly recommend this property to others. The accommodation was excellent and the location was perfect! We booked the apartment for a week and it was exactly as described, within walking distance of shops, restaurants, bars and the harbour. We tried to do as much as we could but unfortunately there wasn't enough time so we will definitely return! Our stay was fantastic and I would most certainly recommend a visit. 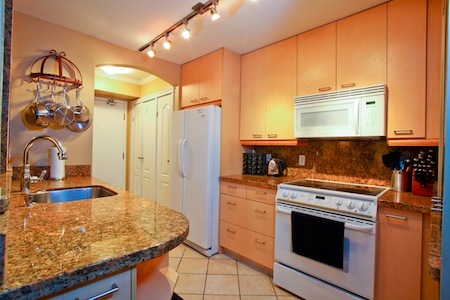 The condo was centrally located, great secure parking and easy driving to parks and other areas. The property had an owners manual type of guide book for operating questions on the systems TV, internet, DVD players, appliances that helped after being shown around. The fully equipped kitchen helped reduce some of the eating out costs. No regular coffee pot so had to use instant but got by. Short drive to the convention center and plenty of parking under the convention center. Remember, in Vancouver you pay to park pretty much every where you go, get plenty of coins The greeting service was really friendly, helpful and informative. Our greeter was only a phone call away if we needed her. We did check out early the day we left and she was able to be there with no problems. I was a little concerned about the security deposit charged on our credit card but it was credited back within a week of our return home. Overall an excellent property ready to move in and make yourself at home. Next time we start planning an extended stay out of town, I'll start looking at offers similar to EMR Vacation Rentals and plan from there, when they're available. Thank you for providing us with your experience at the West End Oasis and we are glad to hear you had a terrific time. We checked the inventory and there is a French press available. It made us aware that not every guest might be familiar with this sort of coffee maker so we will make sure greeters point it out at future check ins. We hope to see you back soon. I almost don't want to write a review in fear this condo will get too booked up and won't be available next time I visit Vancouver. 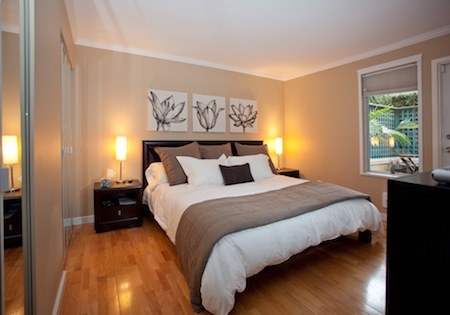 The location can't be beat, halfway between Robson and Davie and a quick walk down to the beach. The courtyard patio is half covered making it perfect to sit outside even when it is raining. The beds were super comfortable and the owners really did think of everything from kitchen gadgets to office equipment when needed. The rain shower in the one bathroom may be the best shower I have ever used. I will definitely be visiting again, it really helped make our trip great! Accommodation was exactly what I wanted and where I wanted to be. Supremely organized. A real pleasure.It was obvious that suite was prepared with care that went beyond expectations. Will book again. Thank you.